A tall order for a man who famously answered an interview question with “Well, when the president does it, that means that it is not illegal.” Of course, in follow-up discussion on that answer, he added that he came to realize that not everyone agreed with him on that particular point. So ensues a fascinating game of cat and mouse between the disgraced former U.S. President and the British talk show host. Each man has his own personal motives for entering into an agreement for what would become an historic set of interviews. For Frost, he’s looking to restore his place in the entertainment industry after a costly cancellation of his New York-based talk show. During the course of the backstage segments of the play, he talks about how New York was more exciting than either London or Sydney, and he wants that glitz and notoriety back. For Nixon, he wants to restore his personal legacy and reputation after being forced out of office. He’s tired of being exiled in California and wants a positive return to the public eye and the east coast where the real action is. Historically, both men were ambitious. Both enjoyed great celebrity and success in their respective arenas prior to their downturns. At the outset, Nixon seems positioned to devour Frost based on his training and intellect, but appearances can sometimes be deceiving. Director, Leslie Martinson worked with two casting directors for this production: Jeffrey Lo for local casting and Alan Filderman for New York casting. The two leads are played by New York veterans Allen McCullough (Nixon) and Jeremy Webb (Frost). The local cast members include Kenny Toll (James Reston, Jr.), Craig Marker (Col “Jack” Brennan), Alicia Piemme Nelson (Evonne Goolagong), Adam Shonkwiler (John Birt), Adam J. Saucedo (Manolo Sanchez), Patrick Russell (Irving “Swifty” Lazar, Mike Wallace), Elena Wright (Caroline Cushing), and Stephen Muterspaugh (Robert Zelnick). David Lee Cuthbert provided the scenic and media designs for this production, all of which create a cozy framework for each location. The upstage wall is comprised of a video mosaic that extends the stage in many ways. 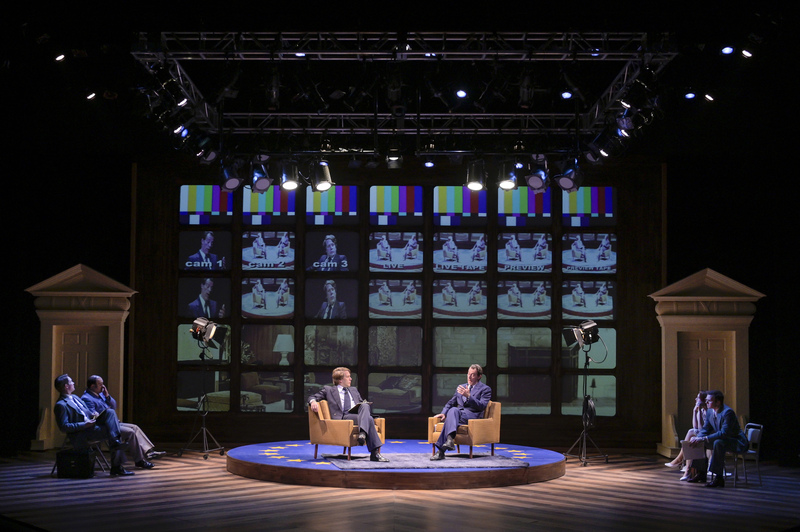 When the setting is the location for recording the interviews, the mosaic provides a believable back wall showing the room they are in, and shifting live views of test patterns, close-ups of Frost and Nixon, and in one segment, news events to highlight the discussion. In another scene with Mike Wallace, an iconic image indicates they are on the 60 Minutes set. When the scene moves to Nixon’s estate, the grounds are projected on the mosaic behind the action. Two smaller, mobile set pieces provide screens for scene enhancement. When Nixon is in the hospital, he sits in a wheelchair in front of a mobile screen giving the appearance that he’s in the middle of a long hospital hallway. 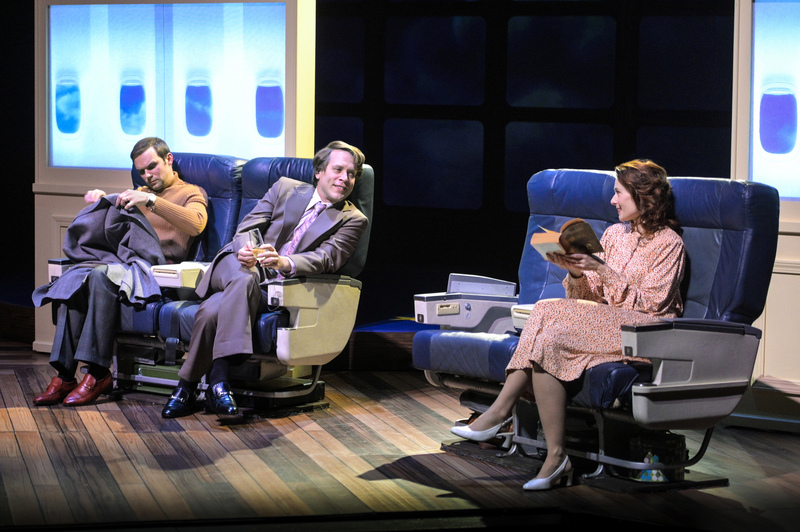 In a scene inside an airplane, two rows of first class seats are placed in front of the mobile screens showing airplane window views as Frost and Cushing flirt. Cathleen Edwards’ costume design depicts the 70s nicely. Martinson’s use of freezes heightens the focus on narration from the supporting cast that fills in details between the main conversations. The narration and area lighting also allow for quick, seamless shifts between settings. The play is fast-paced, and the tension is maintained throughout. The story not only contains portions of the interviews reenacted as they originally aired, it fills in much of the backstage and planning sessions surrounding the interviews, using a bit of poetic license along the way to add some entertaining and enlightening insights beyond the public’s purview. 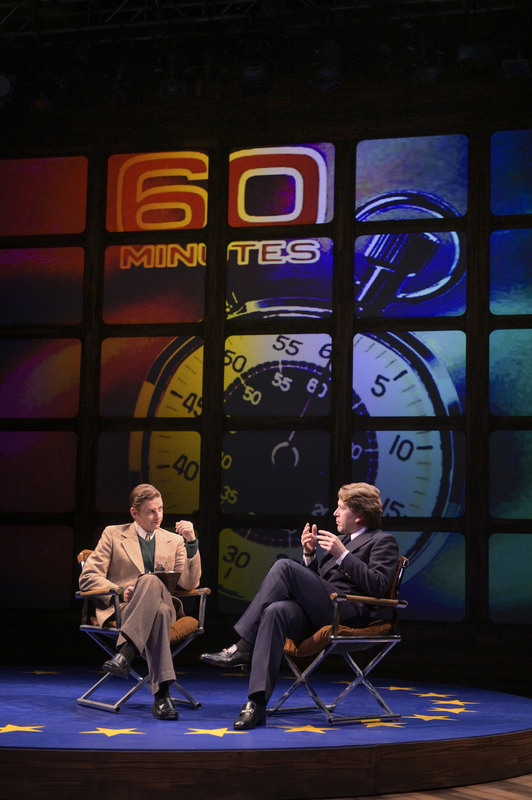 One scene in particular, depicting an off-the-record, private, late night conversation between Nixon and Frost that never actually happened, appears plausible in context, setting the scene for the thrilling final interview session. McCullough captures the essence and demeanor of the Nixon we remember, but in a more humanized way. He makes his character more approachable than strict news reports might imply, and at times, he’s even likable. Webb’s Frost comes across as a bit of a manipulator, initially outmatched by Nixon’s prowess, but his shrewdness grows throughout the story. Both Frost and Nixon are “handled” by their advisors, although they each ultimately break out on their own, going beyond the optics they are advised to consider. 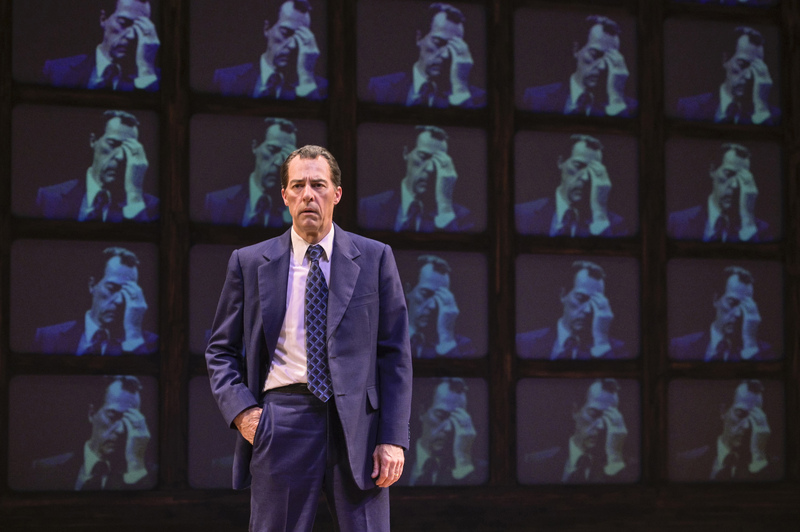 In real life, Frost was the only one to whom Nixon publicly confessed, and this monumental event is dramatized with the intense emotions of the moment rippling through the audience. The investigations discussed are public record. The actual interviews are available on DVD. The play provides a condensed, and fascinating commentary on this still all-too-pertinent bit of American history showing the links between news and entertainment, and the lines between authority and abuse of power. This production is presented without an intermission, the time flies by, and the mesmerizing presentation keeps audience members on the edge of their seats. See below for a brief preview of this exquisite production. See Frost/Nixon, email boxoffice@theatreworks.org, or call (650)463-1960 for more information or to order tickets. ← SJ SaxMas is coming to town!